Registration for the 2019 Pacific Puddle Jump is now open. To join, please click on Sign Me Up on the left side of this page. 10am-2pm Country Inn and Suites, Amador. Co-hosted by the Balboa YC, the Pacific Puddle Jump and the South Pacific Sailing Network. 10am-2pm at Shelter Bay Marina. 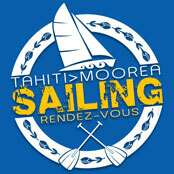 Co-hosted by Shelter Bay, the Pacific Puddle Jump and the South Pacific Sailing Network. 2-6 pm at the Vallarta YC, Nuevo Vallarta. 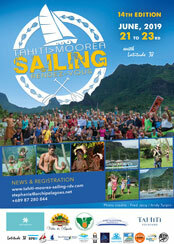 Co-hosted by the Vallarta YC, the Pacific Puddle Jump and Latitude 38 and the South Pacific Sailing Network. Among long-established international cruising rallies, the Pacific Puddle Jump is unique. 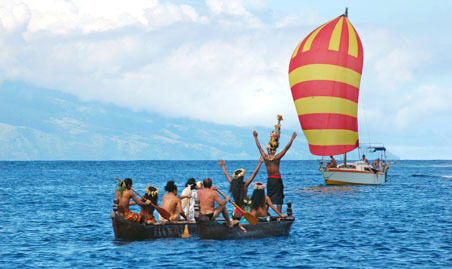 Rather than its entire fleet departing on the same day from the same port, as most rallies do, Puddle Jumpers from many nations set sail for French Polynesia — anytime between February and May — from various points along the West Coast of the Americas. Despite the dispersion of each year's fleet, though, on-the-water camaraderie has always been an element of the Jump, achieved via radio nets and buddy boating. And each year we maintain an extensive 'safety database' that includes details on each boat's communications resources and emergency gear — info that has been crucially important during several offshore emergencies. This year, without sacrificing the loosely structured nature of the Puddle Jump, we're taking steps to improve both fleet safety and fleet-wide camaraderie during this 3,000-to-4,000-mile bluewater passage. Every boat will be required to check in daily via email or another electronic means, and its position will be plotted on a special web page available to invited family and friends (on an opt-in basis). Brief electronic status messages can accompany each boat's plotted location (if opted-in), and boats in mid-ocean will be able to request low-res graphics from our shore base that show the location of fleet members who are relatively close to them. These and other innovations are meant to make the crossing — which can take a month or longer — safer and more fun. And take the whole Puddle Jump experience up a notch or two in terms of added value. The 'participation fee' this year is $75 per boat ($60 for boats shorter than 35 feet or owners younger than 35 years of age). Registering online at www.pacificpuddlejump.com gives you access to all sorts of important fleet info, an official PPJ burgee and other swag, invitations to PPJ parties, and discounts from sponsors and supporters, including a substantial discount from a Tahitian yacht agency on a special PPJ package that includes clearance in and out, 'repatriation bond' exemptions for your crew, and duty-free fuel access, beginning at your first clearance port in the Marquesas. Dates of this year's PPJ Sendoff Parties are February 28 at Panama's Balboa YC, March 1 at the Shelter Bay Marina (also in Panama), and March 4 at the Vallarta YC in Mexico's Nuevo Vallarta. All of these events will be supported by the newly formed South Pacific Sailing Network. Who does the Puddle Jump? Both young and old sailors from a wide variety of countries. They all have adventurous spirits, of course, and whether sailing aboard million-dollar yachts or vintage fixer-uppers, they all share the dream of idyllic South Pacific cruising — a vision that many of them have been nurturing for decades. What is the Pacific Puddle Jump? Find out here. How you can obtain a 'bond exemption'. Important information on getting a Long Stay Visa. Be sure to check out this year's PPJ sponsors. We encourage you to support them, as we greatly value their partnership in administering the Puddle Jump. This site was last updated on April 12, 2019. This is the official homepage for the annual Pacific Puddle Jump rally. It is not to be confused with the PPJ group hosted by Yahoo. Although that group is not directly affiliated with Latitude 38 or this site, the group members share useful tips and info about Puddle Jump-related topics. All would-be South Pacific cruisers are welcome to join it.